*Automatically creates two viewports and see the plan and profile views of the selected pipe or structure. The user can select the part in plan or profile and the program will split the screen and zoom to the corresponding view in both viewports. *Swap parts of multiple pipes and structures. The parts to be swapped can be selected in plan or profile view. *Easily retrieve and modify the name, slope, start and end invert elevation of a pipe. *Align the crown and center elevations of two pipes, match their slopes and add a drop between them. These actions can be combined, for example, the user can align the crown of two pipes and at the same time match their slopes. *Match the invert elevation of a pipe with the sump elevation of a manhole. *Easily retrieve and modify the name, rim-to-sump depth and sump elevation of a manhole. 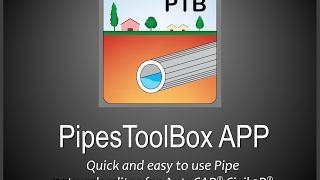 Very good and useful app, simple to use and intuitive; Simplifies work and reduces time in pipe network editing! Integrates all necessary editing combinations like swap parts, edit elevations or slopes and more. The display plan-profile option is quite useful if you design Drainage networks in large proyects; otherwise you get lost very often!